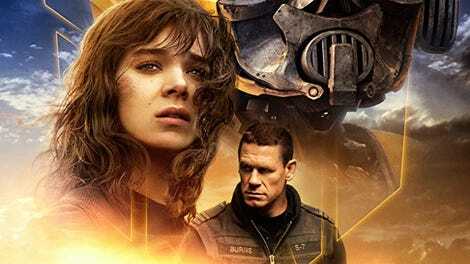 Bumblebee may be the best Transformers movie, but does that mean it’s any good? Was the first live-action Transformers movie really long enough ago to qualify for its own nostalgia revisitation? Granted, it’s been 11 years and five movies since that franchise-starter, but it came out of the gate already coasting on the mashed-up nostalgia for producer Steven Spielberg’s ’80s-fantasy glory years and the unrelated toys of that same age. Now Bumblebee, the first Transformers picture not directed by Michael Bay, is even set in 1987 (just a year after the release of the animated Transformers: The Movie). The era only registers superficially, primarily in the outfits and shirt-broadcasted music tastes of 18-year-old Charlie Watson (Hailee Steinfeld). Her vintage band tees, busted moped, and Smiths fandom are all supposed to signify period-appropriate lower-middle-class outsider status—but even Charlie’s rumpled sleepwear looks an awful lot like a 2018-friendly Urban Outfitters version of the ’80s. That Steinfeld rocks the most genuinely stylish look of any Transformers lead so far isn’t really a complaint, especially because her screen presence is the best thing about Bumblebee. She brings a raw-nerve irritability to Charlie, still smarting from the death of her dad. She also resents her loving mother (Pamela Adlon) for finding solace in an amiable doofus (Stephen Schneider), who gives Charlie that timeless, useless male tip: Hey, you should smile more! An unsmiling Charlie is lot more compelling than the everydude vibe of 2007 Shia LaBeouf—which makes a particular difference given that she’s essentially re-enacting (or, given the timeline, pre-enacting) the kid-and-first-car-swept-up-into-intergalactic-warfare story of the first film, right down to that first car’s secret identity. Bumblebee’s ’87 disguise is a yellow Volkswagen Beetle, as opposed to the first movie’s Camaro, but his status as a flunky of the eternally bloviating Optimus Prime remains. He’s on Earth to establish an Autobots base, presumably the first measure in their Operation Enduring Occupation. (For more details on this plan, see almost any Transformers sequel.) After Bee loses his memory and his voice box, Charlie stumbles upon him in car form at a repair shop. Little does she know that her knew car/friend is being hunted by a pair of evil Decepticons (Angela Bassett and Justin Theroux) who have manipulated the U.S. government into helping them. Travis Knight, stepping into his first live-action film after helping to run the animation house Laika (and directing their movie Kubo And The Two Strings), seems to feel obligated to ease the audience into a somewhat smaller, somewhat gentler iteration of Transformers. So despite a blessedly decreased scale, the movie still opens with an elaborate, heavily animated visual-effects battle on the Transformers’ home planet before the war reaches Earth and intersects with the U.S. military. Jack Burns (John Cena) is even a Michael Bay Lite figure in that he’s introduced in the midst of bullying that’s supposed to be funny, and eventually must confer solemn, soldier-grade approval on the heroes to validate them. A major difference between Bumblebee and previous Transformers is that the military is allowed to disappear for long stretches of the movie. Despite his opening caution, Knight understands that Transformers adventures might be aimed at children, rather than the angrily horned-up 13-year-olds who Bay seems to both picture as his target audience and resent with every fiber of his being. In addition to refashioning the gearhead, car-coveting hero as a young woman (no small thing in such an ogle-heavy series), the filmmakers give Bumblebee a little more personality in his movement; he makes more human gestures in his posture, and the movie doesn’t linger on endless, senseless transforming sequences. Bee now snaps back into car form with impressive comic timing. The sheer number of cosmetic improvements almost makes Bumblebee more disappointing in the end, because it’s still a careless stretch of blockbusting. Relationships, whether between Charlie and Bee, Charlie and her semi-charming love interest Memo (Jorge Lendeborg Jr.), or Charlie and her excitable little brother (Jason Drucker), are developed in hastily scrawled shorthand, a jumble of notes about stuff that usually happens in a movie. This applies to the most basic plot mechanics, too; the movie pays so little mind to Bumblebee’s memory erasure that it’s easy to forget how crucial it’s supposed to be. The idea appears to be a riff on (or rip-off of) The Iron Giant, where a potentially powerful weapon ditches its programming and discovers humanity—which is a difficult story to tell while also taking a laissez-faire attitude toward killing. Knight may have made a family-friendlier movie, but he also takes advantage of how he can apparently show people being liquefied right there on screen, as long as the resulting goop is watery instead of bloody. Bumblebee isn’t the one doing the liquefying, of course, but the movie still wants its audience to root for him to eventually strike back at his enemies. If the Iron Giant is a gun who doesn’t want to be a gun, Bumblebee is a gun who’s fine with it as long as he can have some nights and weekends off. Thematic muddles would matter less if Bumblebee delivered more as an action movie, but despite some neat car-chase complications, this series remains stubbornly averse to shaping its action barrages into satisfying set pieces. In the past, this was because the filmmakers seemed hellbent on providing nonstop sensation. Here it’s because they’re newly convinced that their series can generate real warmth. If only not being terrible was the same as being good; Bumblebee is still just reheated nostalgia. Steinfeld and her robo-car make a cute pair, but their emotional moments are ultimately as calculated as her wardrobe—and not nearly as fun.